Welcome to Landers McLarty Toyota, where we have a vast selection of brand new Toyota models to choose from. Are you after a sleek new ride that doesn't forgo luxury for safety? Then we invite you to make the short trip over to our Fayetteville, TN dealership to experience the brand Toyota Camry. This newly designed vehicle carries cabin upgrades including its expansive and comfy interior, user-friendly driver controls, excellent visibility, and noteworthy rear seat space. The 2016 Camry also offers high-tech features like the Qi wireless charging pad. 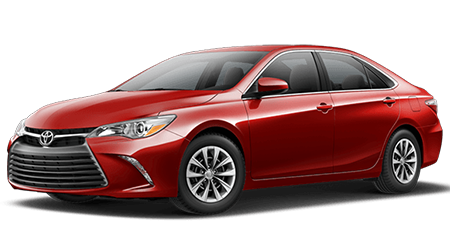 Its affordable price tag makes it an option for a wide range of financial backgrounds so check out the Toyota Camry at Landers McLarty Toyota, located near Huntsville, Columbia and Murfreesboro, TN. Are you ready for some serious options? Talk to one of our friendly associates about your driving habits and we'll gladly suggest some viable powertrain options that will enhance your Tennessee lifestyle! All 2016 Toyota Camry models arrive standard with front-wheel drive, a six-speed automatic transmission and a 2.5-liter four-cylinder engine that generates 178 horsepower and 170 pound-feet of torque. Jump up to the Camry XSE and XLE trims to get offered an optional a 3.5-liter V6 rated at 268 horsepower and 248 pounds-feet of torque. No matter which option you choose, you can rest assured you're obtaining one powerful ride! Head over to Landers McLarty to explore all your available 2016 Toyota Camry trim options. Our knowledgeable team members can walk you through all your choices and help you narrow down which one suits your driving needs. Across the trims you’ll find a comfortable and generously equipped sedan with loads of features that make for a galvanizing drive. Test drive the SE trim to experience a sport-tuned suspension, sport-themed exterior styling, and interior trim elements. The 17-inch alloy wheels, leather-trimmed steering wheel with paddle shifters, 4.2-inch color driver information display, and cloth and synthetic leather upholstery are sure to put a smile on your face. Options for the Camry LE and SE include an Entune Audio Plus package that includes an upgraded 7-inch display and touchscreen, HD radio, and satellite radio. A sunroof is also an option. The new trim this year, the Camry SE-based Special Edition, adds the Entune Audio Plus package and a sunroof as standard. This trim also includes 18-inch wheels, keyless entry, keyless ignition (including hands-free trunk opening), smoked taillights, blue interior trim (including seat inserts and contrast stitching), unique gauges, and Qi wireless smartphone charging. The Camry XSE doesn't include the sunroof, keyless entry, keyless ignition, or the wireless phone charger, but it does maintain the sport-tuned suspension and adds heated front seats, LED running lights, 18-inch wheels of its own, a four-way power passenger seat, and dual-zone automatic climate control, and leather and synthetic suede upholstery. Schedule a test drive today! Talk to our team members about all the available packages designed with your comfort in mind! The Convenience Package is available for the Camry SE and four-cylinder XSE trims that include keyless entry and ignition, hands-free trunk opening, and an auto-dimming rearview mirror. The Camry XLE trim is equipped similar to the XSE, but moves to the LE's comfort-oriented suspension tuning and removes the sporty styling elements. It features 17-inch alloy wheels and full leather upholstery. Because choices are important the options don't end there! Options for the Camry XSE and XLE include blind-spot monitoring and rear cross-traffic alert system, 10-speaker JBL sound system, and the Technology package (lane-departure warning, a pre-collision warning and braking system, adaptive cruise control, and automatic high-beam headlight control). We invite you to make the short trip over from Huntsville, Columbia or Murfreesboro, TN to our Fayetteville location to experience the all- Toyota Camry. We have so many ways to help get you behind the wheel of this sleek ride, so ask about our specials and impressive rebate programs. We look forward to welcoming you into the Toyota family soon!